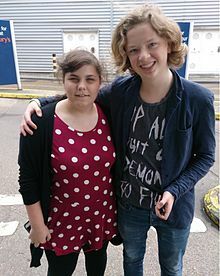 Eros Vlahos (born 13 January 1995) is an English-Greek actor and comedian, probably best known for his roles as Cyril Gray in Nanny McPhee and the Big Bang, Jake Farley in Summer in Transylvania, and Lommy Greenhands in Game of Thrones. He also appeared in a recurring role on the television series Da Vinci's Demons, as Nico Machiavelli. Eros Vlahos was born in London on 13 January 1995. His parents are Terry Davy (mother) and Spiros Vlahos (father), and he has a younger brother, Tron Vlahos. He is of British (maternal) and Greek (paternal) ancestry. Vlahos' parents also work in commercial partnership with one another; his mother as a fashion designer and his father as business manager. They own and operate the original Cyberdog shop in Camden Market; a futurist and rave-scene fashion, accessory, and toy retailer which they founded together in 1994. Their pet chihuahua, "Chichi the Cyberdog", inspired the name of the store and was featured as part of its brand-image. The family still keeps a chihuahua as a pet in the present-day (as of 2013). Eros attended day-school (as opposed to boarding school) in London. He draws, and assembles Lego sets as hobbies. He is a sports fan, particularly of football, and likes going out to movies and live-theatre shows. In an interview on GreekReporter about his new role on Da Vinci's Demons and his life, Eros said he likes to visit his friends and family at Filiates, his father’s home village in Greece. 2007 Casualty Liam Hendricks Episode: "Snowball"
2010 Nanny McPhee and the Big Bang Cyril Gray Main character. Outnumbered Marcus Episode: "The Parent's Evening"
In the summer of 2008, at the age of 13, Vlahos wrote and performed his own material at the Edinburgh Festival Fringe. In December of that year, he was recruited to review Christmas pantomimes for the Guardian newspaper and website. He also had a comedy show on Radio London and has appeared on CBBC Extra. He has been involved with the "Comedy Club 4 Kids UK" children's Comedy Academy. Vlahos is active on Twitter, maintains an official website, and has a blog on Tumblr; on which he intermittently posts examples of his comedy writing. He also engages in various other creative activities online, including uploading pictures and occasional videos or video clips. ^ Eros Vlahos [@Eros_V] (13 January 2013). "Yay, happy 18th birthday me!" (Tweet). Retrieved 9 February 2013 – via Twitter. ^ "The Times". The Times. UK. Retrieved 24 January 2012. ^ a b "Teenage Eros laughs all the way to a TV gig". The Scotsman. UK. 16 August 2008. Retrieved 24 January 2012. ^ "Eros Vlahos (@Eros_V) - Twitter". twitter.com. Retrieved 16 September 2017. This page was last edited on 14 March 2019, at 23:32 (UTC).